Paul A. Cohen, professor of history emeritus at Wellesley College and also an associate at the Harvard Fairbank Center, has long been interested in not just what happened but also how historians tell the stories of the past. As one of the strongest advocates for China-centered historical work, Cohen has explored this tension between history and its telling in works that sometimes reveal unknown stories and sometimes confound the traditional tellings of well-known historical events. These earlier works include China Unbound: Evolving Perspectives on the Chinese Past, History in Three Keys: The Boxers as Event, Experience, and Myth, China and Christianity, and Discovering History in China. Because of the summer's rise in coverage of Chinese nationalism and its relationship to notions of "national humiliation," a subject about which Cohen has written, we got in touch with Cohen to chat about current politics as well his forthcoming book from UC Press, Speaking to History: The Story of King Goujian in Twentieth-Century China. China Beat: I assume you've seen Orville Schell’s recent piece in Newsweek, in which he mentions your work on the power of the idea of “national humiliation” in Chinese historical memory. I was wondering if you had any thoughts to share about Schell’s essay—or about the longer version that appeared in the New York Review of Books? (1) The views of different sectors of the population—urban/rural, highly educated/less well educated, young/middle-age/elderly—need to be disaggregated and analyzed carefully. It shouldn't be assumed that they’re all identical either in nature or origin. (2) The mystery of the young, who are identified in the article as being among the most intense in their sense of victimization in spite of having been born in the post-Mao years, is a conspicuous example. There was a major effort beginning in the early 1990s to indoctrinate this part of the population with the importance of “not forgetting” (buwang) the suffering and humiliation of the imperialist interval in China's history—an interval they themselves hadn’t experienced. This was part of the broader phenomenon of resurgent nationalism that marked these years and was strongly pushed by the state, in part to supply a substitute form of legitimation for a Communist party whose original Marxist-Leninist-Maoist vision had lost much of its shine. It’s important to look at the content and approach of the modern Chinese history this sector of the population has been exposed to. Yuan Weishi got into trouble a few years back for pointing out how little it has to do with reality. (4) I liked Schell’s discussion of the uneasy relationship in China today between pride and insecurity, so conspicuously embodied in the importance many Chinese attached to the Olympics. The quest—almost a yearning— for the admiration and respect of the rest of the world, above all the Western world, reminded me of the polarity in Riesman's Lonely Crowd between other-directedness and inner-directedness. The former is dependent on the approval of others; indeed, it is geared toward earning this approval. If the approval isn’t granted or is granted only with qualifications, initial pride can suddenly morph into resentment, anger, and deepened insecurity. All of which I see as being intimately connected with the concluding part of Schell’s discussion, where he writes about the ways in which China's history over the past century and a half has been intertwined with that of the West (and Japan), and how crucial it is, in particular for the bilateral relationship between the US and China, “for us to understand as much as we can about its almost infinite complexity.” The Chinese portrayal of the Olympics as unassailable evidence of China’s having finally “made it” and the insistence of numbers of people—and governments— in the West on identifying the ways in which China has still not made it points to an important sense in which Chinese and Westerners continue to speak past one another instead of reaching for the more complex mutual understanding Schell prescribes. The Chinese, in their elaborate preparations for the Olympics coming-out party, drew attention to the great strides the country had made over the past quarter century in its economic development, as symbolized most accessibly (for Olympics attendees from abroad and TV viewers around the world) by the makeover of Beijing; the accent was heavily on externals (wai). Westerners, while genuinely admiring China’s external successes, have persisted in raising discomforting questions about the less visible human costs paid in the process: the depredation of the environment, the tight hold the state continues to exert on a range of political freedoms, the forcible removal of people from their homes to make way for new construction, the low level of tolerance (on the part of both the state and society) for the cultural preferences of non-Han minorities and unauthorized religious groups, the excessive and illegal taxation of impoverished farmers, the pervasive corruption at all levels of the state, and so on. In other words, precisely at the moment that China has at last reached impressive levels of wealth and power—the main goals fueling Chinese nationalism for over a century—the West, while duly acknowledging this, has upped the ante: wealth and power aren't enough, it seems to say, you still have a lot to learn about how to run your country internally (nei). China Beat: As a follow up, since Schell was writing before the Olympics, I was curious to know if the way that the Games played out and were covered changed your thinking at all about concepts of “national humiliation” and how they figure in the contemporary Chinese consciousness? Or, to put this another way, do you think the Olympics might come to be seen as a turning point moment in the development of Chinese nationalism? Paul Cohen: A small turning point maybe, but not a large one. As just suggested, China is still open to serious criticism from the West and will remain so for the foreseeable future. A majority of Chinese would likely agree with some of the criticisms (the pervasiveness of corruption and environmental devastation, for example), although they would probably prefer not to hear them repeatedly voiced by Westerners. Other of the criticisms—the severe limitations on political freedom, the discrimination against ethnic minorities and certain religious movements (most conspicuously the Falun Gong)—a great many Chinese appear not to feel strongly about. But whether they agree with the criticisms or not, many Chinese will continue to see in their venting a frustrating refusal on the part of Westerners to accord their country the level of acceptance they feel it merits. This will continue to carry the potential for resentment, especially when the world's failure to give China its due is perceived as resonating with the victimization narrative with respect to foreign imperialism. This narrative was very strong in China in the decades from the Twenty-One Demands of 1915 until the outbreak of the Sino-Japanese War. During the Mao years it was eclipsed by narratives of heroic resistance. But, as I noted in my response to your first question, in the post-Mao era the theme of victimization returned with a vengeance and remains strong to this day. This can be seen in the handling of modern Chinese history in school textbooks and the explosion of writing on national humiliation (guochi). It is also clearly evident in the representations of Japanese imperialism in Chinese museums, where (as Kirk Denton shows) the trend in the recent past has been “toward an emphasis on atrocity and victimization and away from the narratives of heroic resistance that dominated in the Mao era.” [“Heroic Resistance and Victims of Atrocity: Negotiating the Memory of Japanese Imperialism in Chinese Museums,” Japan Focus, posted Oct. 17, 2007] As long as the sense of victimization remains strong (at least among certain sectors of the Chinese population)—and although for now it mainly targets Japan, given the right circumstances it can almost instantaneously be transferred to the US or some other country—the reemergence of a particularly ugly form of Chinese nationalism remains, in my view, a distinct possibility. 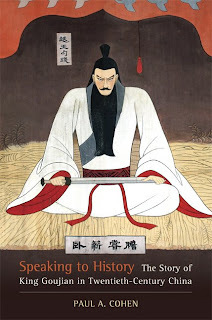 China Beat: Your forthcoming book, Speaking to History, deals with the story of King Goujian and its resonances for twentieth-century Chinese. UC Press’s page for the book notes that one of the book’s themes is the way that stories like Guojian’s are a kind of “cultural insider knowledge.” How did you stumble over the Guojian story and recognize its implications for modern history? How would you recommend that students and historians go about learning and tracking that “insider knowledge”? Paul Cohen: I started out with the intention of doing a book on Chinese sensitivity to national humiliation over the past century. However, in pursuit of this goal, I kept running into the story of King Goujian, which, I came to realize as I dug deeper, spoke not only to national humiliation but to much else as well. Clearly, if I stayed with the original plan, I would have to omit vital parts of the Goujian story’s engagement with twentieth-century Chinese history, something I was increasingly reluctant to do. Elizabeth Sinn helped me out of the quandary I was in by proposing that, instead of national humiliation, I consider writing on the impact of the Goujian story in all its facets. A simple suggestion, but also a radical one, as it meant a shift both in the book’s specific focus and in the broader issues that would ultimately form its intellectual core, above all the relationship between story and history. Although only half realizing at the time the scholarly adventure that was in store for me, I was tantalized by Elizabeth’s suggestion and decided to go with it. Part of the ensuing adventure involved the exploration of source materials I had made little or no use of before in my work, such things as opera librettos, plays, school lessons, novels, mass education materials, television dramas. But the more important part was the discovery of an aspect of Chinese culture and history that had previously passed me by. I refer to Chinese stories and the vital role they have played over the centuries in the cultural schooling of China's population. The Goujian story—and the woxin changdan ("sleeping on brushwood and tasting gall") proverb derived from it— was as familiar to Chinese school children as the biblical stories of Adam and Eve or David and Goliath are to American youngsters—the story is “in our bones,” a scholar from China said to me not long ago. Yet, despite its far-reaching impact throughout the Chinese cultural world, among American students of the recent Chinese past (those, that is, not of Chinese descent) it appears to be largely unknown. Manifestly, the story of King Goujian is one of those artifacts of cultural knowledge, found in every society, that “insiders,” people who have been raised and gone to school in the society, are apt to have instilled in them from an early age as part of their cultural training, but that “outsiders,” those who learn about the culture mainly from books or from having lived in the society for brief periods as adults, almost never run into (or don’t notice when they do). As a result of this curious situation—a situation that suggests the existence of two quite different tracks for learning about a culture—the place of the Goujian story in the history of China over the past century has been omitted entirely from the work of American historians (and, as far as I know, Western historians generally). The second part of your question—how should students and scholars go about tracking what I refer to in my book as “insider cultural knowledge”?—really needs to be broken down. Learning about such knowledge per se really isn’t difficult, but before this can be done we need first to recognize that it exists, not only in China but in all societies, and then to decide how important we think it is and why. Chinese historians of the twentieth century, unlike many of their American counterparts, are intimately familiar with the Goujian story and keenly aware of the pervasiveness of accounts of (and references to) it, especially at certain historical junctures. But I have found little indication that they see the relationship between story and history in itself as a fit object for serious inquiry. The foremost reason for this, I suspect, is that most Chinese simply accept the existence of the story-history relationship as a given. It isn’t, in other words, something that they have a high degree of self-consciousness about. The notion that stories even from the distant past can speak in meaningful ways to what is going on in the present is something that has been inculcated in them from childhood. They pay attention to such stories, therefore, for the guidance or inspirational value they may offer in the present, but there is little likelihood of their stepping back and interrogating the distinctive importance of the story-history relationship as such, either in China or in other cultural settings. There is another reason as well for the failure of historians to include the Goujian story in their accounts. This is that the story, for all its importance in other respects, contributes little to the history of twentieth-century China when this history is framed as a narrative of interconnected events. Indeed, it can be omitted from this narrative almost entirely—as it has been—without significantly altering the overall picture. (This is of course also true of many other aspects of intellectual and cultural history.) On the other hand, when we shift our attention to the ways in which the Goujian story has affected Chinese perceptions of their experience—a more interior perspective on the Chinese past—we get a very different sense of things. As the psychologist Jerome Bruner has stated, we “cling to narrative models of reality and use them to shape our everyday experiences. We say of people we know in real life that they are Micawbers or characters right out of a Thomas Wolfe novel.” Such stories become “templates for experience.” What is astonishing about these templates, he adds, “is that they are so particular, so local, so unique—yet have such reach. They are metaphors writ large” or, as he puts it in another place, “root metaphors.” [Making Stories: Law, Literature, Life (Cambridge: Harvard University Press, 2002), pp. 7, 34-5, 60] When the Goujian story is understood, in Bruner’s sense, as a root metaphor—or as several such metaphors—it assumes a far more imposing historical presence than we would ever guess from the standard narrative accounts of twentieth-century Chinese history. It is this presence that I seek to illuminate in Speaking to History. China Beat: Classical stories are an important component of contemporary Chinese pop culture—movies, television dramas, novels. What do you think the popularity of these stories tells us about China today? Paul Cohen: Good question. One thing we need to be reminded of is that, with the exception of certain highly politicized periods (such as the Cultural Revolution), classical stories have long been an important part of Chinese popular culture. Until quite recently opera played a key role in this respect. “In the Ming and Qing dynasties,” Barbara Ward tells us, “the overwhelming majority of opera performances took place in public . . . , in front of unrestricted audiences as mixed as and very much larger than those of sixteenth-century England.” “For the great mass of the population” during this time, she adds, “the entertainment media, especially the festival operas, were the most significant source of information about the believed-in historical past, the values and manners of the elite, attitudes and relationships between and among people of different status, and ideas of good (which usually triumphed in the end) and evil (which was usually routed).” [“Regional Operas and Their Audiences: Evidence from Hong Kong,” in David Johnson, Andrew J. Nathan, and Evelyn S. Rawski, eds., Popular Culture in Late Imperial China (Berkeley: University of California Press, 1985), pp. 172, 186-7] Opera, often centering on classical stories, continued to play an important role in popular entertainment well into the twentieth century. Its audience began to decline, however, with the emergence of a mass television viewership in the early 1980s. A significant part of television programming overall has dealt with historical drama, which, for millions of Chinese, has been extremely popular. In fact, in 2006-2007 the Goujian story alone was the subject of no fewer than three long-running TV productions (each with more than forty segments), featuring in every instance a star male actor in the role of Goujian. One thing the popularity of classical stories reflects—especially among those old enough to have clear memories of the rampant politicization of the Mao years—is the relative freedom from political constraint in the private lives of many in China today. For such individuals, reconnecting with the old stories, without the imperative of having to look constantly for hidden political messages, has been a genuinely liberating experience. For China's television and publishing industries (especially the former), it has also been hugely profitable. The case of the Goujian story is instructive. From the 1920s until the end of the 1970s, in the many versions of the story that I have seen, inclusion of the darker side of the protagonist's makeup that emerged after the conquest of his archrival, the state of Wu, was either avoided entirely or explicitly subordinated to Goujian's extraordinary achievements in rejuvenating Yue. This was especially true of the years of Mao Zedong's supremacy, when turning the spotlight on a brutal, ruthless Goujian might too easily be read as indirect criticism of Mao himself. (After Goujian's victory over Wu, the Yue ruler turned against his most loyal ministers, much as Mao had turned against Peng Dehuai at the Lushan Conference and Liu Shaoqi and others during the Cultural Revolution years.) After the end of the Mao era, however, this pattern underwent a decisive shift. The shift occurred in two phases. In the early 1980s, in works by two politically fearless writers, Xiao Jun and Bai Hua, the callously ambitious, hard-hearted side of the Yue ruler, largely absent from renderings of the Goujian story in the first eight decades of the century, was reinstated with the clear intent of censuring Maoist tyranny (something that at the time was still too risky to venture in more open ways). Then, with the progressive relaxation of state control over society and the depoliticization of everyday life that marked the 1990s and 2000s, the multipart television adaptations of the Goujian saga mentioned earlier and a number of novelistic renderings of the story that also appeared, all without exception incorporated the Yue king's brutal side. By this point in time, unlike the early 1980s, there was no apparent fear that inclusion of this component of the story would be misconstrued as politically motivated. In the rapidly developing Chinese economy of the turn of the twenty-first century, the promotion of the Goujian narrative (not to mention hundreds of other stories from China's cultural heritage) was driven above all by commercial gain. Entertainment had now taken precedence over political guidance, and the more frightening features of Goujian's character could be given full play simply because they made for a better story. China Beat: In the book, you trace the persistent importance of Guojian in the twentieth century, though presumably the way the story was read and understood changes over time. What were some of those different meanings? Are there other classical stories that you encountered in your research that also pop up over and over again, and seem important to understanding China in the same way? Paul Cohen: On a spectrum of Chinese cultural stories ranging from the simplest to the most multifaceted and complex, the story of Goujian clearly belongs among the latter. As a result, Chinese during the twentieth century, faced with a succession of historical crises, were able to cull from the larger story specific themes that seemed to them tailor-made for the crisis of the moment. Let me cite a few examples. During the period from the imposition of the Twenty-One Demands in 1915 until the outbreak of the Sino-Japanese War in 1937, the constant refrain in the Chinese press and elsewhere was the humiliation to which the country had been subjected at the hands of the Japanese. The slogan wuwang guochi—“Never forget our national humiliation”—was on everyone's lips and the desire for revenge was widespread. In these circumstances, patriotic Chinese instinctively turned to the Goujian story, at the core of which was the humiliating defeat Goujian had suffered early in his kingship and his dogged persistence, over many years and in the face of every difficulty, until he was finally in a position to avenge himself against the state of Wu. In the annual National Humiliation Day observances of the 1920s and 1930s marking China's capitulation to the Twenty-One Demands, it was the story of Goujian rather than the stories of such patriotic heroes as Yue Fei or Zheng Chenggong or Qi Jiguang that was endlessly alluded to in Chinese newspapers. A third crisis situation in which the Goujian story took a significant part in the twentieth century centered in the late 1950s and early 1960s, the time of the Great Leap famine and the growing rift in China's relations with the USSR. In response to these developments (in particular the latter), beginning around 1960, writing on the Wu-Yue conflict and Goujian's part in it became for a few years a major preoccupation of Chinese writers. The well-known historian Wu Han and others introduced the story in newspapers, magazines, and short books, calling attention in particular to the themes of “self-reliance” (zili gengsheng) and “working hard to strengthen the country” (fafen tuqiang), both much emphasized at the time by the central leadership of the party. The longtime Minister of Culture Mao Dun, who published a little book on the Goujian story in 1962, estimated that in the winter and spring of 1960-61 close to a hundred theaters and acting groups all over the country staged opera performances on the story (he himself claims to have read some fifty different scripts). Also at this time Cao Yu, widely viewed as China's leading playwright of the twentieth century, ventured for the first time into historical drama with a five-act play on the story entitled The Gall and the Sword (Dan jian pian). The play was first performed in Beijing in 1961 when Cao Yu was at the height of his prestige. Apart from the above examples, I encountered in my research many other stories from the Chinese past that were seen as resonating with particular historical circumstances. My sense is that the Goujian story, because of the many disparate themes it encompasses, was called upon more frequently than most such narratives, but it was certainly not unique in this respect. China Beat: What are you reading about China (and liking) lately? Have you read things recently about places other than China that have caused you to re-evaluate Chinese historical events? Paul Cohen: Not long ago I read two books about China that I really loved: Peter Hessler's Oracle Bones: A Journey Through Time in China (HarperCollins, 2006) and Mo Yan's novel (as translated by Howard Goldblatt) Life and Death are Wearing Me Out (Arcade, 2008). It would be hard to find two more dissimilar books. Yet each, in its way, offers stunning insights—political, social, and cultural—into how China works . I'll take a pass on the second question. Generally, when books I read that don't have to do with China shape or reshape my understanding of Chinese history, it happens in the course of my research and writing when I'm actively looking for non-China perspectives. In thinking through some of the core themes in Speaking to History, for example, I found much stimulation in the work of people like Jerome Bruner (Making Stories), Yosef Hayim Yerushalmi (Zakhor: Jewish History and Jewish Memory), Roger Schank (Tell Me a Story: Narrative and Intelligence), Avishai Margalit (The Ethics of Memory), and Yael Zerubavel (Recovered Roots: Collective Memory and the Making of Israeli National Tradition). When I read other books not relating to China—recent examples are Philip Roth's The Human Stain, David Lodge's Home Truths, Jhumpa Lahiri's Unaccustomed Earth, Omer Bartov's Erased: Vanishing Traces of Jewish Galicia in Present-Day Ukraine, and Nicholas Dawidoff's The Crowd Sounds Happy: A Story of Love, Madness, and Baseball—I'm mainly interested in nourishing the rest of me, not in coming up with new ways of understanding China (although this of course could—and sometimes does— happen). China Beat: Is there anything you wish I had asked that I did not? Paul Cohen: It took me a long time to come up with the title for Speaking to History. But once it popped into my mind I knew that was it. What the title suggests is that the Goujian story (which is referred to in the book’s subtitle) spoke to Chinese history at various junctures in the twentieth century. A number of your questions (and my responses to them) circle around this issue. But the key question somehow slipped through the cracks: What does it mean for a story to “speak” to history? This question is, in the broadest sense, what my book is about. But before getting to that it might be helpful to briefly introduce an entirely different kind of relationship between story and history. Recently I started reading Barend ter Haar’s Telling Stories: Witchcraft and Scapegoating in Chinese History (Brill, 2006). The book is about the relationship between a certain kind of story (rumors and other forms of “local news,” often part of Chinese oral tradition and centering on popular fears) and collective action. Years ago I corresponded with ter Haar about some of his core ideas, some of which I later cited in the chapter on “Rumor and Rumor Panic” in History in Three Keys. I am intrigued now by the qualitative differences between the stories he deals with in his book and the Goujian and other stories I am concerned with in Speaking to History. My stories, unlike his, generally have a real historical basis and are widely known within the Chinese cultural realm. Although in many cases emerging out of Chinese oral tradition, they have often played an important part in the written history of Chinese literature as well. Another key point about my stories is that, unlike the ones ter Haar is concerned with, they are more important for their part in shaping the cognitive environment surrounding historical events than for directly giving rise to these events. And also, in this connection, the historical events they resonate with are in most cases national in scope rather than, as in ter Haar’s book, local or regional. A central riddle that I am concerned with in my book has to do with the relationship between past story and present reality that in China, as elsewhere, has exerted such power. Why are peoples, at certain moments in their collective lives, especially drawn to narratives—commonly derived from the distant past—that resonate strongly with their present historical circumstances and speak to these circumstances in compelling ways? This mating of story to history, abundantly demonstrated in the career of the Goujian saga during China’s turbulent twentieth century, forms a stratum of veiled meaning the illumination of which is one of the main tasks I set for myself in the book. A larger point to be made about the connection between past story and present history is that it serves as a potent instrument for defining a culture’s boundaries, both objectively and subjectively. Narratives like the Goujian story that are widely known among a culture's members constitute a form of symbolic sharing that is absolutely key both to the culture's objective existence and to an individual’s subjective sense of belonging to that culture. Although missing from conventional historical accounts, such stories are important because of what they tell us about the interior world of a culture at particular moments in time, how those inhabiting this world felt—and how they talked and wrote—about the predicaments facing them, individually and collectively. What is so astonishing is that, in spite of their importance, Western students of twentieth-century China (including myself) have in the past shown little awareness of their existence. My hope is that, in Speaking to History, by focusing on one such story and the rich variety of ways in which it functioned over the past century, I have been able to convey some sense of what we have missed.